Egypt's President Abdel-Fattah El-Sisi said in his meeting on Tuesday with Saudi Arabia's Crown Prince Mohammed bin Salman that Egypt is keen to boost bilateral cooperation and coordination, and affirmed the depth and strength of the ties between the two countries. 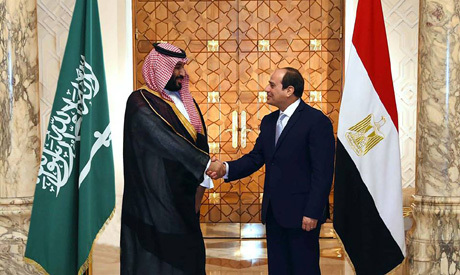 According to a statement by El-Sisi’s spokesman, he told the Saudi crown prince during the meeting in Cairo that the coordination between Egypt and Saudi Arabia should be at the highest level in order to face the current developments and challenges in the Middle East. The Saudi royal arrived in Egypt on Monday night as part of a regional tour that has seen him visit the UAE and Bahrain, with a stop in Tunisia scheduled after Cairo. During the visit, the Saudi delegation accompanying the prince, which includes investment and media officials, held meetings with their Egyptian counterparts. In a meeting with the Saudi media delegation, chairman of Egypt's Supreme Council for Media Makram Mohamed Ahmed said that coordination between Egypt and Saudi Arabia is important on all levels to protect joint interests and defend Arab national security. Makram also underlined the necessity of regularly holding such meetings to discuss joint interests and international developments. Chairman of the Saudi Press Agency Abdullah Bin Fahd Al Hussein said at the meeting that the Saudi media delegation is keen to promote coordination between the two sides in order to serve joint interests and Arab causes. The Egyptian-Saudi Business Council also held a meeting on Tuesday in Cairo attended by Saudi Minister of Trade and Investment Majed Bin Abdullah Al-Qasabi and Egyptian Minister of Electricity Mohamed Shaker. Al-Qasabi revealed during the meeting that a joint committee would be formed grouping Saudi and Egyptian businessmen who are members in the Egyptian-Saudi Business Council to hold meetings with Egypt's Minister of Investment Sahar Nasr and Minister of Industry Amr Nassar with the aim of removing impediments facing investors in both countries. Al-Qasabi also said that the volume of trade exchange between the two countries has hit $7.3 billion, while Saudi direct investments in Egypt have exceeded $3.4 billion. He added that the number of Saudi companies in Egypt has reached 5,000. Meanwhile, chairman of the Federation of Egyptian Chambers of Commerce (FECC) Ahmed El-Wakil said that a plan was being prepared to upgrade Saudi-Egyptian relations through cooperation between the two sides' trade federations. He highlighted the process of activating cooperation in the small and medium-sized projects between the two countries, especially after a projected meeting between the two countries' federations set for 18-19 December in Aswan. El-Wakil made it clear that Egypt has become more attractive to investors after the government introduced a package of financial, legislative and procedural reforms. He also highlighted a reduction in the balance deficit to 9.5 percent and a rise in the foreign reserve to $44.4 billion, adding that such developments give confidence to Saudi investors.